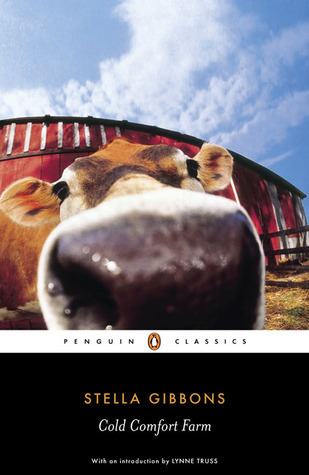 Cold Comfort Farm was the book the recent Classics Club Spin chose for me to read. I did actually manage to read it before the end of June, as the rules stated, despite the fact that I’m posting my review in July! This is the story of Flora Poste, nineteen years old and recently orphaned, who decides to go and live with her relations. After writing to various family members and dismissing their offers as being unsuitable, something in the reply she receives from her cousin Judith Starkadder at Cold Comfort Farm in Sussex appeals to Flora and her mind is made up. Flora thinks she knows what to expect from life on a typical Sussex farm (it will be bleak, miserable and old-fashioned – and there’s sure to be a farmer called Amos and two young cousins called Seth and Reuben). As soon as she arrives she discovers that Cold Comfort Farm really is the typical farm she had imagined. Each of the farm’s inhabitants has their own set of problems that require Flora’s assistance, so armed with one of her favourite books, The Higher Common Sense by the Abbé Fausse-Maigre, she begins to ‘tidy up’ the lives of the Starkadders and help them adapt to modern life. Not having read this book before or seen the adaptation, I didn’t know much about it before I started except that it was a parody of the British rural novel and supposed to be funny. Now, I’m going to be completely honest here and admit that I didn’t find it as funny as I’d expected. A sense of humour is such a personal, individual thing (and I do have one, honestly!) so who can say why a book works perfectly for one person and not so perfectly for another. I did think it was very clever, amusing and witty, but not hilarious. Anyway, it helped that I’ve read some of the types of books Gibbons is parodying (such as Thomas Hardy’s rural novels, for example) though it’s probably not essential to be familiar with these books. What I enjoyed most about this book was meeting the collection of eccentric characters who live on the farm, from Amos Starkadder, Judith’s husband, who preaches at the Church of the Quivering Brethren to Aunt Ada Doom who “saw something nasty in the woodshed” when she was young and hasn’t left the farm since. Another of my favourites was Adam, the old farm hand who “cletters” the dishes with a twig (isn’t that a great word?) and refuses to use the little dishmop Flora buys him because it’s too pretty. Something else I found interesting was the fact that this book is set in the future (at least, the future for when it was published in 1932) and there are a few references to video phones and other futuristic elements. I didn’t know about this before I started reading and saw the note at the beginning that told us “the action of the story takes place in the near future”. I’m not sure what the point of this was, though, as it didn’t seem to be necessary or to have any effect on the story. I didn’t love Cold Comfort Farm the way most people seem to, which is a bit disappointing, and it’s probably not a book I’ll want to re-read, but I did still enjoy it and am grateful to the Classics Club Spin for picking it for me! I like the cover of this edition too. I’m glad I could bring this book to your attention! This book shows up on so many lists and I’ve always wondered what it’s about…your review of it is great. I love the idea of all those eccentric characters.Thanks for another great post! I wasn’t sure what it was about either until recently but I knew I wanted to read it as I’d heard so many people say they’d loved it. I remember being fascinated by the programme but I have never for some reason read the book – I should really. Especially since I have the Christmas one on my shelf! I really loved this book. I can’t say I noticed the part about the future though. I’m sorry to hear this book didn’t quite tickle you as much as it has others. Would be a dull world though if we were all the same. At least you did find some enjoyment in it. I did enjoy it, but I wish I could have loved it as much as everyone else! The parts about the future weren’t very obvious and I might not have noticed if I hadn’t read the note at the front that said it was set in the future. I enjoyed this book, but I kept wondering if I was missing something, not having read Hardy in particular. I found the “futuristic” elements really jarring! Yes, the futuristic elements were very jarring, though I was intrigued by them too as there just didn’t seem to be any reason for them! I didn’t love Cold oOmfort Farm quite as much as I expected, but still liked it a lot. I’m generally not that great with parody and I wonder if I would have fared better if it hadn’t had that element? I don’t know.. Parody isn’t my favourite type of humour either, even though I’m familiar with some of the authors this book is a parody of. I have this one on my shelf to read but I may save it for a time when I just need a nice light-hearted pick-me-up story. There are so few of those on my shelves recently, for some reason! I think this book would be perfect for one of those times!